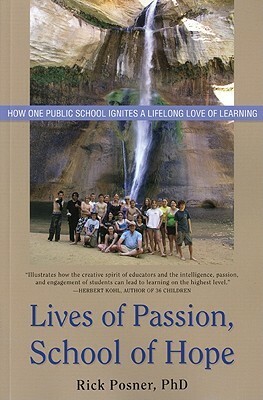 Lives of Passion, School of Hope tells how a progressive public school in Colorado has transformed the lives of its alumni. It is about what happens to children and adults when they are encouraged to follow their bliss. It is also about personal empowerment and the development of confidence, curiosity, and compassion in our public schools. This book offers stories and reflections from the alumni of a school where the students hired the teachers, ran their own government, evaluated their own progress, and designed their own curriculum. It's the story of an extended family of students, staff, and parents who have formed their own community of learners over the course of thirty-eight years. We all have an important stake in our public schools. In these days of teaching for testing, standardization, school violence, and alienation, readers will want to know about a public school that has not only weathered the political and social storms of nearly four decades, but has done so with integrity and success. The alumni and the author offer their perspectives on how a school without grades, credits, or a set curriculum has affected them as adults. Some say it saved their lives Lives of Passion answers questions frequently asked about a school so different from the mainstream: did students succeed in college, what do they do for a living, are they living according to the ideals of the school, are they happy and productive as adults in a democratic society? The answers to these questions are in turn surprising, riveting, and insightful. Lives of Passion, School of Hope points toward a future that may depend on the injection of heart, hope, and passion into our public schools. It is the story of the place of personal growth in public education, and how we can be inspired to create a better world. Dr. Fredric Posner began working for the public schools as a bus driver and custodian. He went on to become a special education teacher, consultant, and alternative school teacher and administrator. Receiving his Ph.D. in 1989, he established his expertise in the fields of self-directed learning and the modern rites-of-passage curriculum. During his time at Jefferson County Open School in Colorado, one of the longest standing public alternative schools in the world, he took students all over the globe, including the West Bank, Gaza and, when the Wall came down, to Berlin. Dr. Posner also taught a wide range of classes that reflect his eclectic personal passions, ranging from Willy Mays, James Joyce, and Muddy Waters to ethnic cooking and marathon running. He is a proud ?graduate? of the Open School (retired in 2001) who has maintained his penchant for lifelong learning by doing service work in Haiti and consulting for alternative schools around the world. Like so many of his fellow Open School alumni, Dr. Posner claims that the school saved his life.